Arthritis refers to many related conditions involving inflammation of one or more joints. 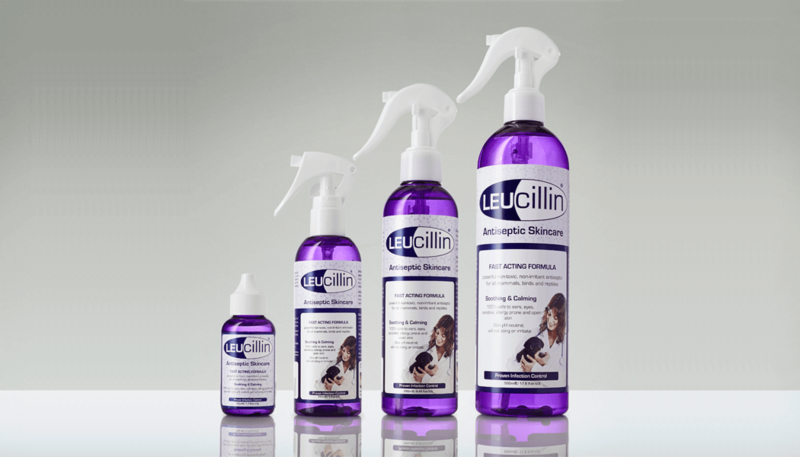 It’s the most prevalent joint disease in dogs, which affects over 20% of adult dogs. Every dog is at risk especially as dogs’ age. 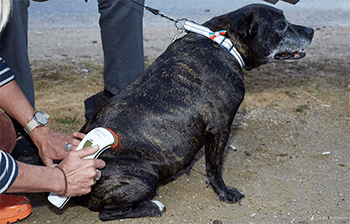 The most common form of Arthritis in dogs is Osteoarthritis or degenerative joint disease. Arthritis causes pain, stiffness, limited mobility and in more chronic cases debilitation. It’s easy to mistake the general ‘signs of ageing’ and slowing down with Arthritis. Dogs suffering from joint disease will find it more difficult to jump, walk, get up and move around. Mr Binks an English Toy Terrier benefits from Photizo as part of his daily care routine for his Legg Calves Perthes disease meaning he only has one hip. Osteoarthritis is characterised by the deterioration of joint cartilage called articular cartilage. The formation of bony growths - called osteophytes, which are found on the joints are also a symptom, as are changes in the subchondral bone and inflammation in the joints. These changes occur following alterations in both the biomechanical and biochemical properties of the joint. Certain breeds especially larger dogs like Labradors, Mastiffs, German Shepherds may be at a higher risk of developing Osteoarthritis because they tend to suffer from inherited / congenital defects such as hip dysplasia, elbow dysplasia or luxating patella. Researchers have identified many inflammatory markers that are turned on in dogs with Osteoarthritis. These markers correlate to inflammation within the cells that make up articular cartilage, which are called articular chondrocytes. A deeper understanding of how Osteoarthritis occurs at the cellular level through gene expression and genetics opens the door to an entirely different treatment approach, including functional nutrients and non-invasive physical therapies. 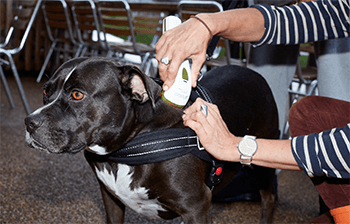 Photizo Vetcare uniquely combines the latest advances in LED technology to offer a hand held, non-invasive modern Phototherapy treatment tool, which is safe and simple for anyone to use. Proven to promote the natural healing process, it offers pain relief and cellular rejuvenation. 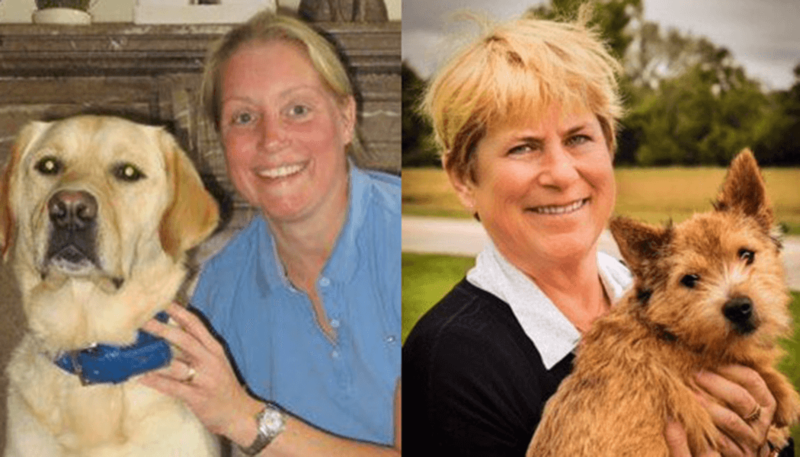 Launched in the UK in 2013 after years of research, Photizo is being embraced by Vets, Vet Nurses, Physiotherapists and healthcare professionals nationwide. Photizo’s unique delivery of LED’s that emit red and infrared light in pre-programmed 30 seconds doses penetrates the skin to stimulate energy and create a biological reaction. The light rejuvenates deep at a cellular level. Whether it’s targeting a musculoskeletal condition like Osteoarthritis or a wound, Photizo stimulates metabolic changes in the cells. Research has proved that Photizo’s red and infrared LED light rejuvenates damaged cells. If we view Osteoarthritis as a cellular degeneration inherited through gene expression, an awareness of ways to stimulate the core cellular energy ATP can work preventatively, managing the cause of bone degeneration. ATP is the major carrier of energy in the cells and is made by the cells power units, the mitochondria. Without ATP all cellular functions cease. An increase of ATP allows cells to accept nutrients faster and to dispose of waste products more efficiently by increasing the energy levels in the cell. ATP provides the chemical energy that drives the chemical reactions of the cell. ATP production is enhanced by light therapy when light provided in an optimal wavelength energises the ‘cytochrome b’ structure, allowing it to donate electrons to the electron transport chain at a greater rate to increase ATP production. Photizo stimulates the energy production inside the cell to cause the cell to function at an optimum level. This upholds and increases cartilage and bone cell functioning. In turn this slows down any degeneration, even rehabilitating the joints deep at a cellular level. Light Emitting Diodes (LED light) do not deliver enough power to damage the tissue, but they deliver enough energy to promote natural self-healing and pain relief. As with laser treatments (another mode of red light therapy), the LED’s power output has been optimised to be at its most effective. The best parameters for light absorption are in the region of 600-680 (red) and 800 to 850nm (nanometers) (infra-red). Doses are measured in joules per area – mm or cm: the smaller the surface area of the applicator the higher the dose. Lasers may therefore apply a high inhibiting dose to the top layer of cells, and a lower stimulating dose deeper to the tissue. LED sources conversely offer a wider surface area. Using comparable parameters as seen with laser can equally provide a stimulating dose at a deeper cellular level. Unlike a laser, Photizo Vetcare is safe to use without the need for cumbersome protective eyewear. It is therefore safe for anyone to use particularly as it is pre-set with one-touch, preprogrammed effective dosages for the treatment of many inflammatory conditions. Photizo Vetcare ensures that the effective amount of joules for specified conditions are delivered precisely and effortlessly. By naturally reducing swelling and inflammation Photizo relieves pain in minutes and can last up to six hours, or even longer. The anti inflammatory effects are accumulative, which is why a ‘little and often’ approach is most effective. As every dog is different, with each individual condition idiosyncratic, the dosing will be different for every case. As Photizo stimulates the body’s own pain medication secretion (endorphins and serotonin) it reduces any irritability and slows down the speed conduction of the pain nerves. It also effectively relieves the inflammatory process and swelling that causes pressure on the pain conducting nerves that trigger the pain. Any muscle spasms and stiffness that accompany pain can also be reduced with regular Photizo treatment, which promotes increased joint mobility and flexibility. Physical therapies like Photizo Vetcare offers one aspect to the prevention and management of bone disease and musculoskeletal ‘ageing’. It’s no surprise that obese dogs are at more risk of developing arthritis. Carrying a disproportionate amount of weight for the size of their frames will put excessive stress on the joints. Over 40% of arthritic dogs are overweight and these dogs display more severe symptoms than their leaner counterparts (Howard 2012). However, modern science has proved that the relationship between Osteoarthritis and obesity extends far beyond the ‘wear and tear’ to the joints by carrying an excessive weight. There is also a systematic inflammatory connection. Adipose (fat) tissue secretes proinflammatory cytokines. 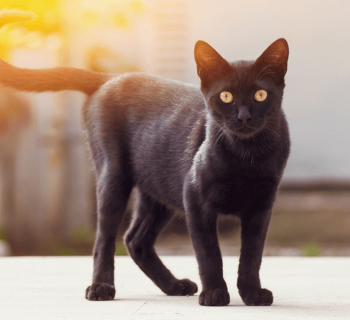 Researchers have now proved that these cytokines increase inflammation in the articular cartilage. Excess adipose tissue not only increases the risk of Osteoarthritis, it also increases the symptoms. In other words, studies have proved that being obese can affect gene expression and in turn cause disease. Once the body becomes preprogrammed for fat, it’s like a neverending cycle as more fat cells lead to more fat cells. The more fat cells there are in the body the more these cells secrete pro-inflammatory cytokines and more chronic systematic inflammation is created. Essentially obesity is a state of chronic inflammation, which leads to chronic inflammatory diseases like Osteoarthritis. Obesity also promotes ‘oxidative stress’ which occurs when there is an imbalance in the body of prooxidants and anti-oxidants: arthritis is associated with increased oxidative stress. Studies show that when dogs suffering from Osteoarthritis lose weight, they experience a decrease in pain, and lameness and increased mobility. 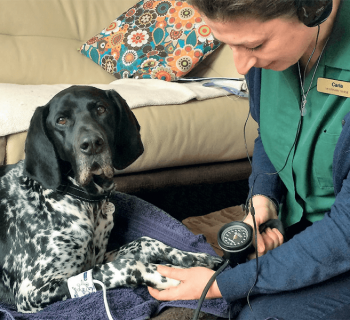 Treating arthritis is dogs involves a ‘multi-discipline’ approach where the integration of different ‘modalities’, including Photizo phototherapy can support an older dog and greatly improve its quality of life. With added awareness, young dogs can benefit from a ‘preventative’ treatment plan that includes its diet. After all prevention is better than cure! 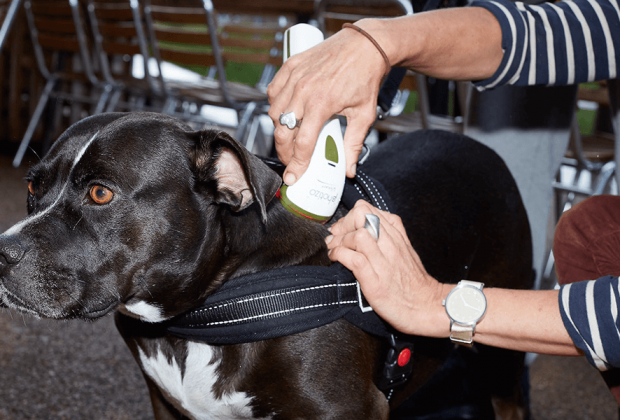 The leading not for profit organisation Dogs on the Streets (DOTS) champions an integrative approach and combines Photizo with weight loss plans some of the older dogs in their care. 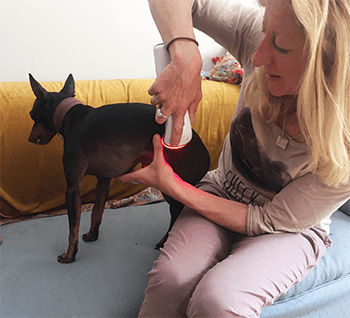 Ruth Milner, MD of Danetre Health Products, the sole UK distributor for Photizo added: “ As Photizo is so safe and simple to use, we hope more owners will use our LED based Phototherapy at home to help as a preventative measure as well as managing existing conditions. 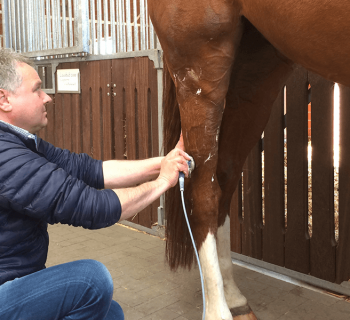 Working with their vet or animal Physiotherapist and building Photizo into a daily health routine will pay dividends across a host of musculoskeletal conditions”.